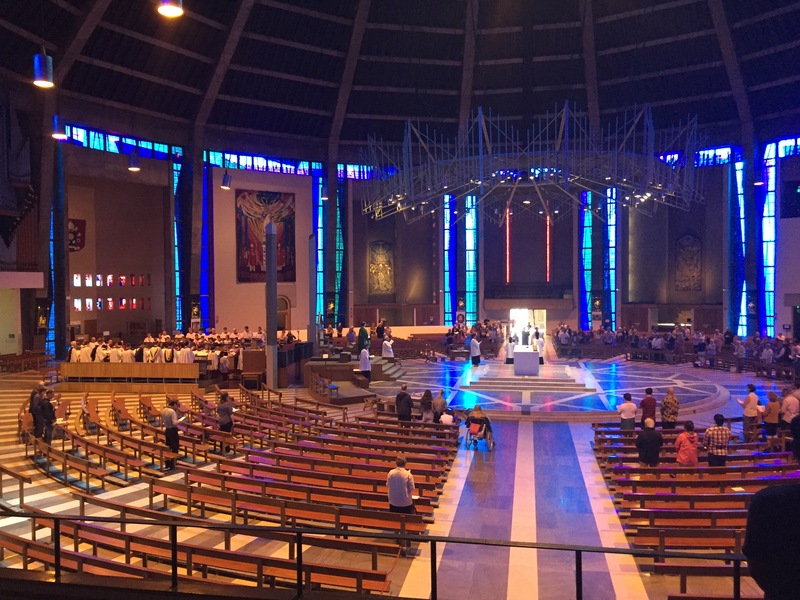 Brentwood Cathedral Choir and the Boy and Girl Choristers of the Cathedral visit Metropolitan Cathedral of Christ the King in Liverpool. Between Wednesday 1st June – Saturday 4th June 2016, people made their way up to Liverpool either by car or by train. It was a fairly long journey but punctuated with a lot of stop offs, especially during car journeys at the service stations! Sometimes they made an extended visit to Liverpool or the surrounding areas for their end of half-term. The weather was great! Some visited relations living up there. Liverpool has some very famous landmarks, the Albert Docks (was a fascinating area), the Liver Building, the two huge cathedrals and the two famous football stadiums of two Premier League clubs, Everton and Liverpool FC. The city itself was a lovely place with character and was filled with great history. We really noticed the friendship and hospitality of the people there. Nothing was too much trouble! People generally stayed in motels and went to a great deal of trouble to fix this. A group of us stayed in the Travelodge on the other side of the river – interesting journey through the Mersey tunnel! The Cathedral itself has a great cafe on site. 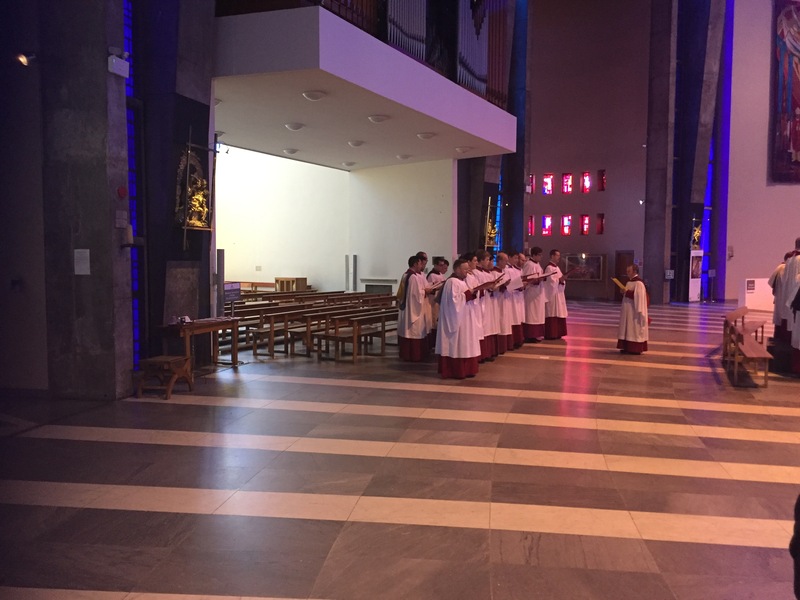 It was very interesting to see all the facilities the Cathedral had for their music. 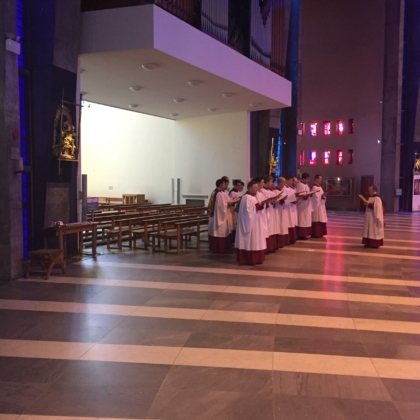 The staff and members of the choir were very hospitable and we were interested to see on the Sunday morning, between the morning rehearsal and mass, the lay clerks there had a tradition of making toast and butter, so a delicious smell permeated the corridors! The Cathedral has a very useful (circular of course!) car park beneath with the offices on the same level. 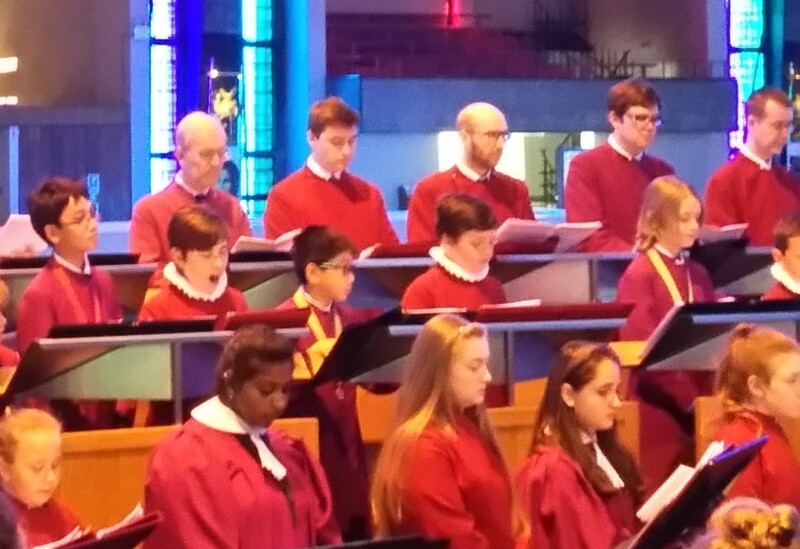 It was spectacular to be able to rehearse in the Cathedral twice that day with all the visitors wondering around. The choir entrance to the Cathedral was a very long sloping ramp and so it felt like we were entering into an ancient amphitheatre. 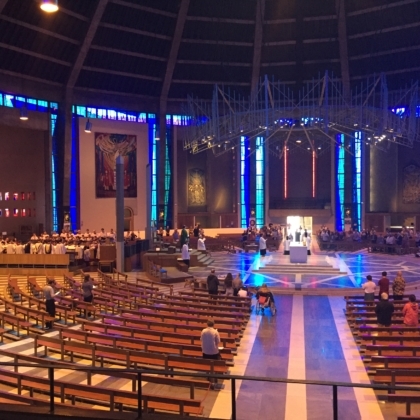 Despite the great efforts everyone had to make for this, the sheer privilege of sitting or singing in this spectacular Cathedral with the simply astonishing stain glass around the edges and of course in the tower made it all worthwhile. At the final reception we were graced with the presence of Colin Mawby for the celebration of his 80th birthday plus a birthday cake! 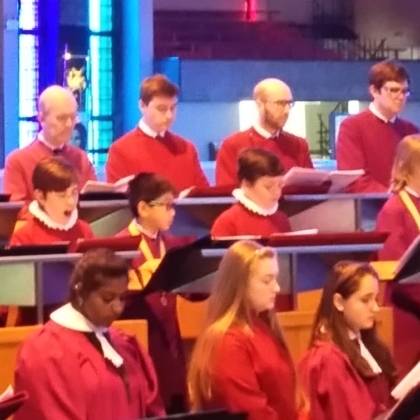 Philip Duffy, the director of music of the Cathedral for 30 years and a very senior figure of the Church Music field, was also there. Oh, the boys also manage to squeeze in some football during the Sunday with the Liverpool choristers! Many thanks to those who came! Special thanks to the enormous hard work and generosity of our parents and families who made this possible!